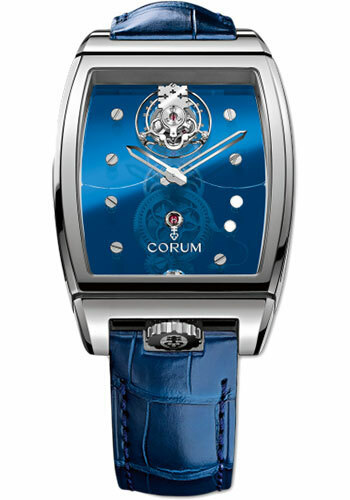 37.50 x 56.00mm 18K white gold case, 12.35mm thick, transparent back with glare proof sapphire crystal, 18K white gold bezel, sapphire crystal crystal with anti-reflective treatment, blue dial, caliber co 100 hand-wound movement, approximately 90 hours of power reserve, blue crocodile leather strap, triple folding clasp buckle. Water resistant to 3 atm. 38mm x 53mm 18K white gold case set with baguette diamonds, transparent sapphire crystal dial, manual winding tourbillon CO 382 movement, approximately 90 hours of power reserve, black crocodile strap with diamond set 18K white gold triple folding buckle. Water resistant to 3 atm. 37.5 x 56mm 18K white gold case, 12.35mm thick, transparent back with glare proof sapphire crystal, 18K white gold bezel, sapphire crystal crystal with anti-reflective treatment, transparent dial, caliber co 100 hand-wound movement, approximately 90 hours of power reserve, black crocodile leather strap, double folding clasp buckle. Water resistant to 3 atm. 37.50 x 56.00 mm 18K white gold case set with 88 baguette diamonds (~ 5.04 ct) and 178 round diamonds (~ 2.41 ct), 12.35 mm thick, screwed in open back with glare proof sapphire crystal, sapphire crystal with anti-reflective treatment, skeleton dial, caliber CO 100 hand wound movement with hours, minutes, flying tourbillon, small seconds, approximately 90 hour of power reserve, black crocodile leather strap, triple folding set buckle with 104 round diamonds (~ 0.84 ct). (Old reference 100.169.69/0F01 0000).